A few things occurred recently that have already shifted the way power in the US is generated. These are most certainly a preview of things to come. This article explores some of the issues. A key point is that two things most certainly will occur over the next ten years: first, many nuclear power plants are reaching the end of their economic lives and will be shut down, probably 50 to 60 of the existing 100 reactors; and second, many of the coal-fired power plants will shut down due to inability to comply with environmental regulations, plus a lack of coal to keep running, as coal is expected to run out within 20 years in the US. The power produced by those two categories must be replaced. The question is, what energy source is ready, economic, and can be built within that time frame? Coal was the main energy source in 1986, with nuclear a distant second. The situation has changed dramatically by 2015, 30 years later. Coal is still the main energy source, but only barely as natural gas is a very, very close second. Nuclear has slipped to third position. Wind has increased from almost zero in 1986 to almost the same percentage as hydroelectric. Oil use has dropped to almost zero. 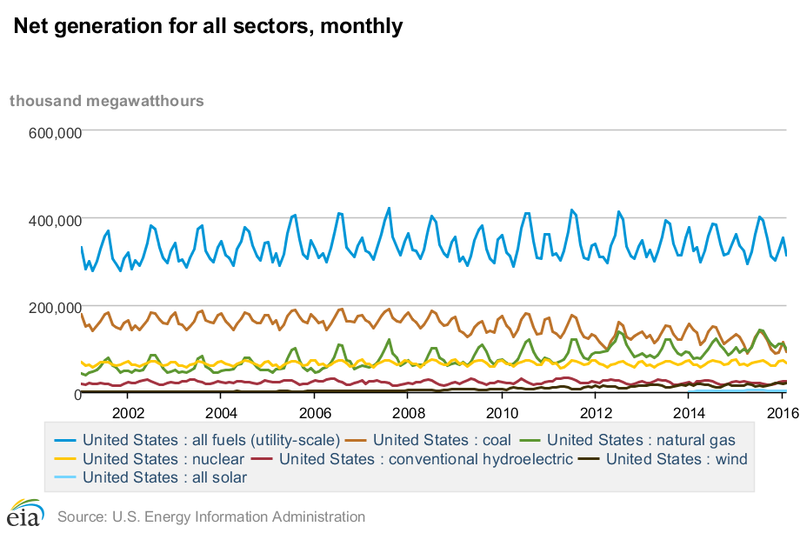 Here is a graph of US power production since 2001, by energy source, from EIA. The graph has a number of interesting aspects, including almost no increase in total electricity use (blue line) over the past decade. 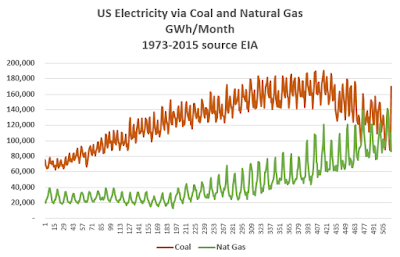 Notable items are the merging of the coal (brown) and natural gas (green) lines in 2015. Also notable is the merging of the hydroelectric (purple) and wind (black) lines in 2015. Finally, and a subject for another post, the nuclear (yellow) line is not at all constant but has substantial fluctuations. 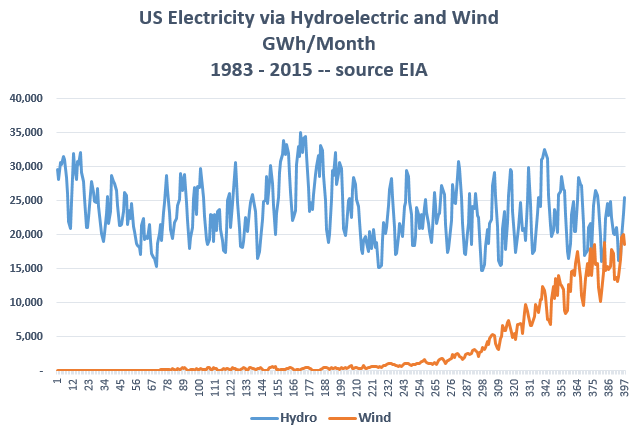 next chart shows how wind energy production (orange line) has grown over the decades, along with hydroelectric power production (blue line). The data is also from EIA, for the US only, and shows the growth of wind energy so that the two lines merge in 2015. The future will almost certainly have wind energy surpassing hydroelectric, as there are no substantial increases in hydroelectric dam construction, but wind-turbines are being built at a rapid pace in many states. coal. As more and more coal-powered plants are closed in the coming decades, and clean-burning natural gas power plants are built in greater numbers, natural gas-derived power will easily surpass that from coal. 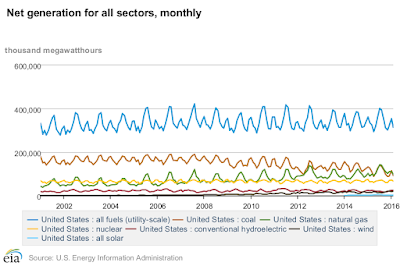 As stated before on SLB, great changes are coming for the US electricity grid, and soon. Environmental regulations that prohibit toxic air emissions, and a lack of long-term supply are driving the closure of coal-fired power plants. Also, the simple passing of years is making the US nuclear plants exceed their 40-year design lives, and many are shutting down before that benchmark as they can no longer compete to produce power profitably in the market. Being old, they would require massive capital infusions to retain the level of safety required by the NRC, but they have too few years of life remaining to recoup those costs. In the next decade, one can expect to see dozens, perhaps 50 or 60 nuclear plants shut down in the US. Presently, nuclear produces approximately 65,000 to 70,000 GWh/month from 100 operating reactors. Fortunately, the US has more than sufficient wind resources to meet the power demand, as nuclear and coal plants are retired. Some critics assert that wind is too variable, too unreliable to meet the grid's needs, but there are several answers to that. First, existing natural gas power plants operate at only 29 percent capacity on an annual basis, or 29 percent capacity factor (per EIA data). On days that have less than peak loads, which typically occur only in the hottest summer months, the existing natural gas power plants can increase output. More natural gas power plants are required, though that is but one option, to meet the demand on the hottest days. Another option is grid-scale storage, which can be accomplished by offshore pumped storage hydroelectric (PSH), or by the new polyacetylene batteries that were announced recently. Yet another option is to store off-peak power, no matter what produces that power, in shore-based PSH plants as the Japanese did on Okinawa Island. That PSH plant uses the ocean as the lower reservoir, and pumps seawater up into an artificial, lined lake on higher ground near the shore. It must be noted that powering a grid with little coal and nuclear has already been done, with California an example, but there are others. Presently, with only two reactors operating in California (at the Diablo Canyon plant), nuclear produces approximately 5 to 10 percent of the grid's needs. As today for example, the California grid had a minimum demand at approximately 4:00 a.m. of 20 GW, and the Diablo Canyon nuclear plant was producing 2 GW, as it stubbornly refuses to reduce output even though demand is low. During peak summer demand, which typically is approximately 45 GW, nuclear is a bit less than 5 percent. Wind energy in California is modest, providing only approximately 15 percent of the grid's daily needs when the wind is strongest and demand is low, such as occurs in April weekends. But, other states have much more wind as a percent of their overall power, with Iowa leading the nation at the moment at just over 31 percent of electricity produced by wind in 2015. South Dakota had 25 percent, Kansas had 24 percent, and others are in double-digits. The future is more wind-turbines in states with sufficient wind resources (but not California, where there is much un-tapped solar in the desert). The future is also more natural gas power plants. The future also has far fewer nuclear and coal plants.